Halloween is my favorite holiday and I love competing in contests! I try to make costumes that make people smile and they can relate to. Usually I choose a weather theme but this year I decided it would be more for fun and not competition (well, that’s how it started at least.) 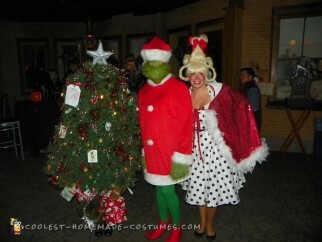 My husband is not enthusiastic about the holiday but last year he bought a nice “Grinch” costume. He actually had a great time at the party we went to that is hosted by a local radio station. I was a Thunderstorm and ended up winning 2nd place (lost by 5 votes) and took first prize at another one! 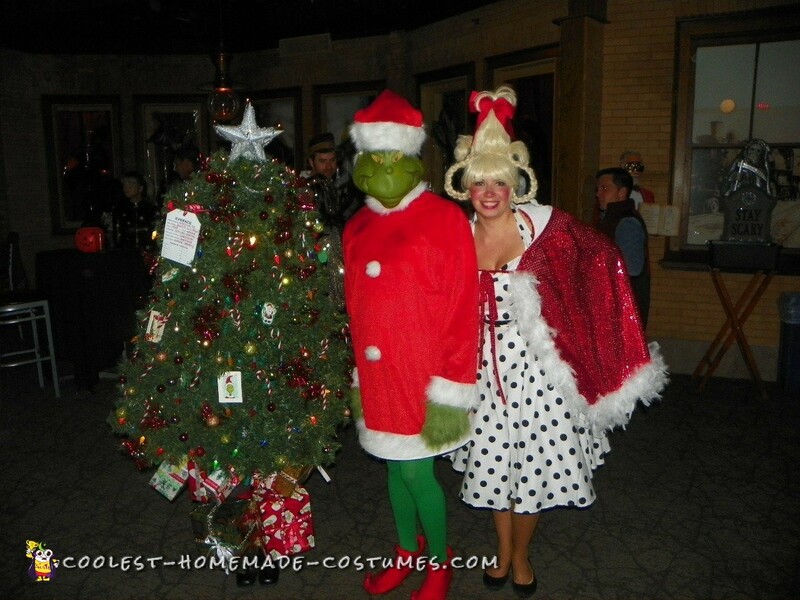 This year I only had 15 days to figure out a costume so I decided if he was the Grinch, I would be “Christmas”. He stole my heart so why not just steal me as a tree and presents? We also had Cindy Lou-Who and Max! I always draw my costume and make a list of what I think I need to pull it off. Bought the bulk of what I needed in one shopping trip, thank goodness they start putting Christmas decorations up in October! Wanted a realistic looking tree that I wouldn’t be visible in. I bought a small pine wreath, large pine wreath, and about 63 ft of pine garland. Using my floor lamp, I used the large wreath to make my collar and started wrapping the branches of the garland around it, using the wire to twist it together. This worked out better than I had imagined and I just kept intertwining it until I had a tree form. I made a hat from the small wreath and used a floral foam cone for the top. Found a nice metal star that I pressed into the foam and hot glued for stability. Added mini battery white lights with paperclips and put silver glitter glue over the star to hide them. Using an old headband, I cut it and tied each end to wreath to secure the hat under my chin. I proceeded to put 5 sets of battery powered lights, small plastic ornaments and garland bunched up secured with pipe cleaner to fill in gaps. Some old Dr. Seuss cards made perfect ornaments with green foam as a base. Finishing touch was my “evidence” tag to convey I was a stolen item. Since I wasn’t quite sure how I’d be attaching pine branches on myself, there was a great 80’s green prom dress at Salvation Army for $12.99, and it fit (barely!). After removing the huge puffy sleeves, I sewed a boys green long sleeve T shirt on to it so I didn’t get picked by branches, at least not as much. Then grabbed small boxes from work, wrapped and then covered in packing tape so paper wouldn’t rip and wired them right onto dress. I used the rest of the T shirt to sew pouches for the battery packs to have access inside the tree. Two of the bigger presents got sewed onto red fabric attached to red headbands and were used as boot covers. The tree “dress” rested on my shoulders and was a bit heavy, so I re-purposed the puffy sleeves and made them into padded shoulders. Knew I had hit paydirt when my husband and friends referred to it as “intense” and unlike anything they’ve seen. Painted my face green and was good to go! Surprisingly, I was able to see and move OK, and danced all night! It was awesome to watch people laugh at the dancing tree or get scared when they realized I was a person. Lots of pictures and hugs. Weird part during all the pics that I was smiling yet it really didn’t matter as my face is covered. We made the top 5 and ended up third that night, first place the next night! The first night was online voting and since my friends didn’t know there was a person in the tree, it may have worked against us. The second night was by applause and we only knew a handful of people, so that felt pretty good with crowd cheering “Christmas Tree, Christmas Tree!!”. Very pleased with how it turned out and all of the great ideas from this website. It’s amazing how creative people can get and is the best part of Halloween!